Are you looking for how to check Bank Verification Number (BVN) on your mobile phone without having to visit your bank’s branch? or Do you need to know your Bank Verification Number (BVN) with your mobile device using USSD code? 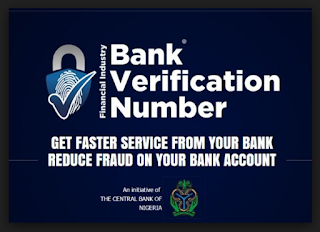 This post, on How To Check Your Bank Verification Number (BVN) with your mobile smartphone Via USSD Code For MTN, 9Mobile, Glo and Airtel will answer all your questions about Bank Verification Number (BVN). · BVN gives a unique identity that can be verified across the Nigerian Banking Industry (not peculiar to one Bank). · Offers great security to your bank account across all banks. · It will address issues of identity theft, thus cut exposure to fraud. · The BVN will enhance the Banking Industry chances of being able to fish out blacklisted customers. · The Customers BVN is accepted as a means of identification across all Nigerian Banks. · Transfer funds from one account to the other. · Withdrawal through ATM or Withdrawal slip. Note: You do not need internet access to perform this operations to check your Bank Verification Number (BVN) Via Your mobile smartphone. · Dial *565*0# with your mobile smartphone. · and Nigeria Inter-Bank Settlement System (NIBSS) will send you the BVN associated with your mobile phone number. Note: Make sure you dial this USSD Code with the phone number you used to open your bank account and is used to check your bank account balance via mobile USSD Code. You can click here to see how to check your bank account balance via USSD Code. · Enter any bank branch of your choice. · Request, fill and submit their BVN enrolment form. · An acknowledgment slip with the transaction ID would be issued to you right away. · In less than 24 hours, you should get a message showing you your new BVN. Now, you can now link BVN with all your bank accounts. Do well to share this post and drop your comment below.